This fund raiser is having URL of each and every case for which the funds are being asked. Sitara- picked up from Ghazipur, Delhi. This girl could not even cross the road in her condition. As usual hit and run case with her hind part paralysed. She was shifted to pampoosh immediately and under the care of Aaditi Badam. She has shown tremendous improvement and hopeful for a good recovery. Her first month stay was funded and now need funds for next two months stay. He is a victim of train accident and was shifted to Umeed Foundation from Friendicos Gurgaon. He is under the care of Nikhil Mahesh. His front right leg has been smashed into two pieces. Plz come forward and help in covering the stay as well as medical costs of Jumbo. We have paid the treatment cost for Jimmy, Romeo, Jumbo and Sitara. Jimmy has even come back to his original location and romeo will be also sent back shortly. We would like to thank you all the donors who have contributed for the cause. 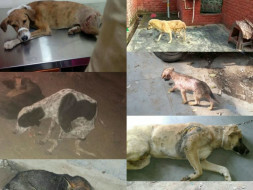 So far, we have been taking care of the dogs and we are grateful to you for the help. It is to inform you that we are withdrawing Rs 6,000 for the medical treatment of Romeo who is just 8 months old and got run over by a car. HIs hind femur bone was broken in two and will need 2 months for complete healing. Thank you again for your support. Please share this campaign with you friends and family.